Not so long ago we didn’t get many emails so it was exciting when an email pinged into your inbox after a long wait, with each new item being read in depth. However, times have changed and now inboxes are overflowing with incoming emails, with the unread number constantly climbing – but it is not the time to forget about email marketing and you should use this valuable tool to your advantage. Email newsletters are thought to be one of the most effective marketing strategies out there and reportedly 66% of online consumers made a purchase as a result of an email marketing message. This is because newsletters help to build and maintain relationships, keep your audience engaged whilst interacting with them, as well as driving traffic to your site. A lot of people sign-up to newsletters for things they are interested in or brands that they like. With a newsletter you can provide them with the information that they are searching for and point them in the right direction. Since so many years, PBS have experience in developing, building and managing national and international company newsletters, tailored for a variety of audiences. We can set-up the tools and templates, then train you on newsletter management, import/export of data and result analysis, so you will be eventually self-sufficient in managing your own communications. 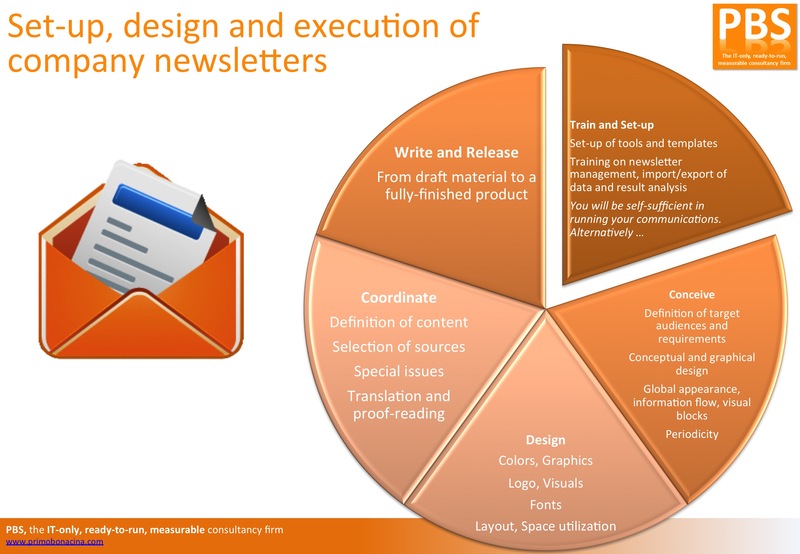 Alternatively, we can autonomously run your newsletter starting from the very beginning (even from a blank piece of paper) up to design, copywriting and full execution, therefore informing your audience on a scheduled basis.